Through these activities, The Tohoku Medical Megabank Project is enhancing the progression of future-oriented health care and cutting-edge research, while contributing to reconstruction efforts. 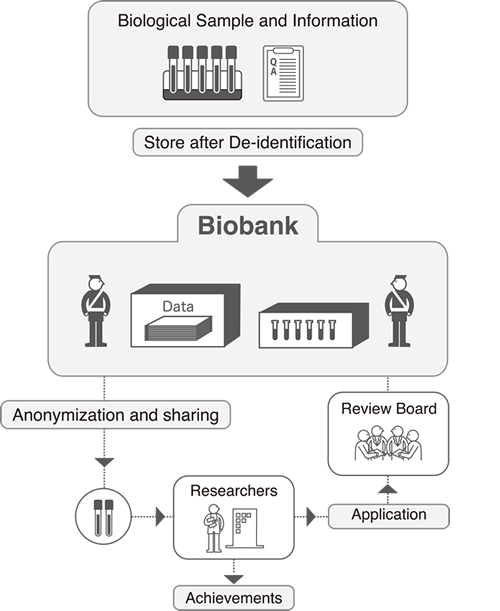 The Tohoku Medical Megabank Project receives genetic information from a total of 150,000 residents giving their consent, and conducts a long-term follow-up on their health-related information. The Tohoku Medical Megabank Project conducts two health study programs: the Tohoku Medical Megabank Project Community-Based Cohort Study (TMM CommCohort Study) and the Tohoku Medical Megabank Project Birth and Three-Generation Cohort Study (BirThree Cohort Study). A cohort study is where information on the lifestyle habits of a large group of people are collected and studied to understand how their habits and the environment correlate with disease. Besides the BirThree Cohort Study, ToMMo also conducts a health study program whose subjects are public elementary and junior high school students in certain municipalities in Miyagi Prefecture, titled the ToMMo Child Health Study. Since 2012, questionnaires have been sent out to more than 40,000 students. The health-related data obtained by the long-term health survey program are provided to local governments and other appropriate institutions for use in health care administration and other relevant activities. Community Support Centers have been established as bases for long-term health studies. They support activities for people participating in the studies, and it is crucial for them to have support and exchanges with community members. Our biobank is collecting and storing de-identified biological specimens including DNA, plasma and serum from blood and corresponding health related and clinical information obtained from the participants of cohort studies. Researchers from various institutions will use those resources for health-related studies, after their research applications are approved. ToMMo is conducting a whole genomic analysis from some of the participants of the cohort studies. ToMMo was the first in Japan to complete the whole genomic analysis of 1,000 people of participants in November 2013, and continues in order to increase their analysis to several thousands of people. This is the first case in the world where a three-digit specimens of a national population with a high level of genetic uniformity was subject to high-precision analysis by a single institution using a single method. The analysis gave hope that completely new research outcomes will follow. The short-term goal is to detect diseases resulting from DNA mutations occurring in 1 out of 100 persons. ToMMo also aims to identify the causes of diseases that are the composite result of genetic and environmental factors. It hopes to establish prevention and treatment methods for these by combining genetic information with the results of from analyses of continuous questionnaire studies, MRI exam, and proteins and metabolites. ToMMo, jointly with Tohoku University Hospital and the Tohoku University School of Medicine, has created a system to dispatch physicians on a rotating basis, which connects communities with a university. ToMMo calls these physicians ToMMo Clinical Fellows (TCF). TCFs build their careers by alternating between providing community medical care in the disaster areas, and concentrating on medical technology training and research. The Center for Reconstruction of Community Medicine, Tohoku University Hospital oversees and operates the system. As of December 31, 2014, more than 50 doctors were posted to medical institutions in the local communities, mainly along the Pacific coast. While some medical care institutions lost their records to the tsunami during the Great East Japan Earthquake, medical care institutions which used long-distance storage services for medical records over electronic networks were able to protect their chart histories. This demonstrates the effectiveness of medical care information networks during disasters. ToMMo is embarking on constructing a disaster-resistant medical care information network covering medical sites throughout Miyagi Prefecture. 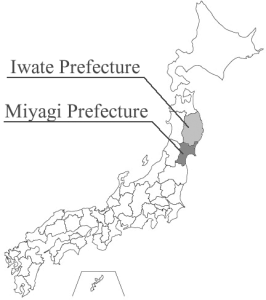 That network will be built in cooperation with the Miyagi Medical and Welfare Information Network (MMWINTM), whose operation brings together all the relevant institutions in Miyagi Prefecture. * "MMWIN" is a trademark of the Miyagi Medical and Welfare Information Network. In this program, ToMMo develops human resources that support and promote community health care and medical care by amassing medical knowledge and techniques. Future medical care will increasingly take into account the individual's physical makeup and lifestyle habits. This program provides a venue for educating and training the large number of specialists needed to achieve that level of care. ToMMo newly established an education and training course with its own original curriculum in 2012, and even now still certifies genome medical research coordinators. ToMMo GMRCs are also recommended to be certified by the Japanese Board of GMRC (Genomics and Medical Research Coordinator) established by a collaboration with Japan Society of Human Genetics and Japan Epidemiological Association. As of March 2015, over 150 ToMMo GMRCs have also certified by the Japanese Board of GMRC. In April 2013, a genetic counseling course was established in the Tohoku University Graduate School of Medicine for developing Genetic Counselors. The course is provided by ToMMo teaching staff. In March, 2015, the first two graduate students in Tohoku area, have finished their master's Program. They will start their career as Certified Genetic Counselor. 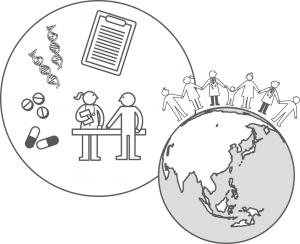 ToMMo encourages the development and certification of medical geneticists through genetic medicine seminars and other activities. As of March 2015, seven Board-certified clinical geneticists work for ToMMo. ToMMo also operates a variety of educational courses in collaboration with the School of Public Health of the Tohoku University Graduate School of Medicine.